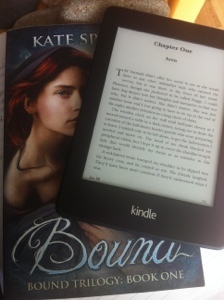 The lovely L Marie asked me some fantastic questions about Bound, and she’s giving away two e-book copies! Get thee to her blog! Thanks for dropping by. 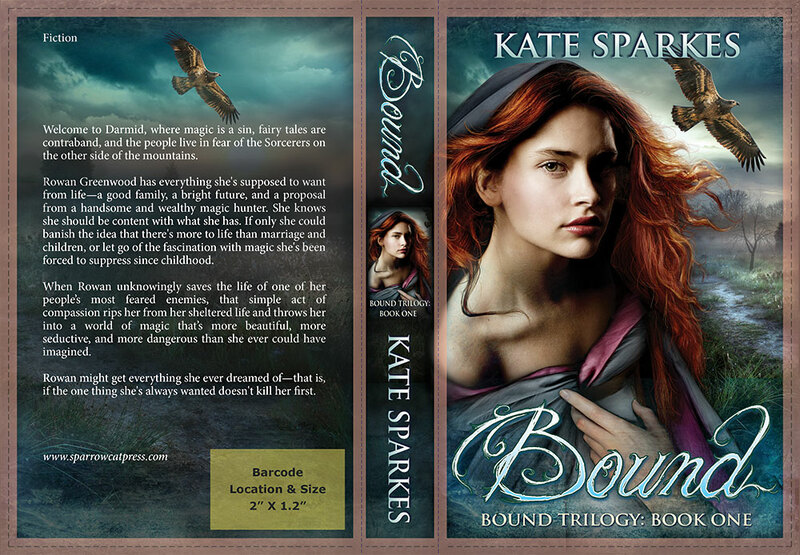 Today on the blog is the awesome and effervescent Kate Sparkes, blogger extraordinaire, dragon enthusiast, and the author of Bound, which was featured here as a cover reveal. 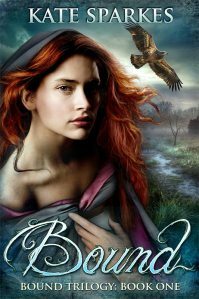 Bound, the first book of a trilogy, was released on June 26. Huzzah! 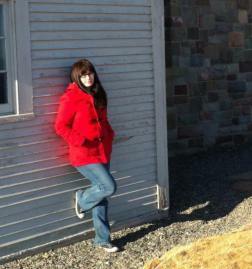 (Click on the cover reveal link if you’d like to read a synopsis of Bound.) To celebrate the release, I’m hosting a giveaway of this very book, which I’ll discuss after I finish talking to Kate. So grab a beverage of choice and make yourself comfortable. Today is the OFFICIAL launch day for Bound! Most of the partying is happening over on Facebook, where I’m giving away a e-books, a signed paperback prize pack, and a few other goodies. But because I like you guys, and just in case you can’t make it over there, we’re going to do an e-book giveaway JUST for you. Let’s hope this works… I’ve never used Rafflecopter before. The book is already getting great reviews, and people who are reading say they can’t put it down. I know I shouldn’t rely on external validation… but that feels pretty good! Click below for the rafflecopter giveaway! I’ll announce the winner tomorrow. Welcome to Darmid, where magic is a sin, fairy tales are contraband, and the people live in fear of the Sorcerers on the other side of the mountains. Rowan Greenwood has everything she’s supposed to want from life—a good family, a bright future, and a proposal from a handsome and wealthy magic hunter. She knows she should be content with what she has. If only she could banish the idea that there’s more to life than marriage and children, or let go of the fascination with magic she’s been forced to suppress since childhood. When Rowan unknowingly saves the life of one of her people’s most feared enemies, that simple act of compassion rips her from her sheltered life and throws her into a world of magic that’s more beautiful, more seductive, and more dangerous than she ever could have imagined. Rowan might get everything she ever dreamed of—that is, if the one thing she’s always wanted doesn’t kill her first. Joanne Guidoccio hosted me on her blog this morning, where I shared a few thoughts on my journey as I wrote and published “Bound.” Also, she spelled my name right, so she gets bonus points! Thanks for having me, Joanne! For over a year, I have followed Kate’s blog and enjoyed her delightful take on the long and winding road to publication. 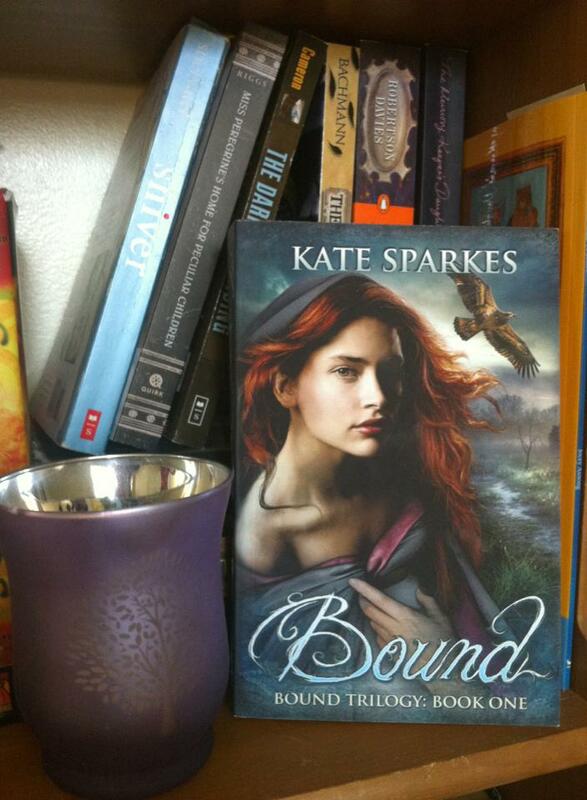 Today, Kate is sharing more of that journey and celebrating the release of her debut novel, Bound. It’s quiet here tonight. The kids are yelling outside, but in here… silence. The book is published. No more scurrying around, making last-minute changes. No more worrying about whether it’s going to be ready in time. Just me, a cat, a cup of tea, and room to breathe. “We” being those participating in round 2 of A Round of Words in 80 Days, and also those of you who have been patiently listening to my ramblings all these many long weeks. How have I done for goals? Well, there’s a book in the world that wasn’t there before. So I guess we’ll call that a victory. All of the e-book sales channels I’m currently using are live (click here for links). The paperback is on Amazon.com, and should be available for Matchbook and on other Amazon sites in a few days. Looks like I hit almost all of the small goals, too. Still need to make that phone call about getting an EIN so Amazon won’t withhold 30% of any sales money. This would totally not be a big deal if I wasn’t afraid of making phone calls. UGH. I’ll do it. I swear. Ditto for the Goodreads giveaway. This will happen when I have my lovely books in-hand. One thing I still need is REVIEWERS. If you are or know of anyone who reviews YA Fantasy (or Fantasy in general, unless they’re the “wimmins and their romantic notions are ruining SF/F breed) and accepts e-books, please let me know in the comments! I’d be happy to send you a copy. So I’m calling this a successful round. I have a few other things to say about the publishing process, but that will keep for another day. For now… just thank you all. No, it’s not officially launch day. We’re not bumping the party up. The celebration still starts on Thursday and continues on to Monday with blog interviews, the Facebook party, and other fun stuff. If you still want to participate, there’s time! E-mail me. We’ll do lunch. Or blog stuff. We have links. I’m only telling you guys because I like you. I’ll update here with the iBooks link ASAP. Amazon isn’t showing the paperback for me yet, but my aunt managed to buy it through Amazon.com… so let me know what you see, will you? I don’t know if she has a magic computer, amazing Amazon Fu, or what. Current e-book price is $2.99. This is an introductory price that will hold until the end of August– regular will be $4.99. This isn’t to pressure anyone to buy, but to say thank you to all of you who are already supporting me and this project. You are amazing. I’ll be adding the purchase links up top tonight, as well as information on signed paperback copies, which you’ll be able to order through me. Because it would be silly to have someone else sign them. Right? I’m kind of new at this. So… I guess that’s it for now. I swear we’ll get back to our normal random, fun, zany shenanigans soon. This week is just a wee bit exciting for me. So, what are you up to? Did you have a good weekend? Oh, and can you recommend a new song that I absolutely must listen to? I need some new music. Hey, Look! It’s a book. It came on Wednesday, delivered by a very nice man with a floofy mustache and a white van. I was crying before I even opened the box, because that’s how I roll when I’ve been waiting years for something. This has never been easy. I’ve never taken shortcuts, though there have been detours and unexpected destinations. I have never worked this hard for anything, and it is totally, completely, mind-blowingly worth it. Wait… it’s almost party time. Yessir (or yes ma’am, or yes creature-of-the-night or yes oak tree if that’s how we’re feeling today), we’re going to have a party. It’s a Facebook party, but dangit, it’s a REAL party. And we’re celebrating a book release. You’ve all been so patient and supportive, encouraging me through the tough parts of this project, celebrating the small victories, offering advice or a loving kick in the pants when I needed it. I think we all deserve to have some fun, don’t you? 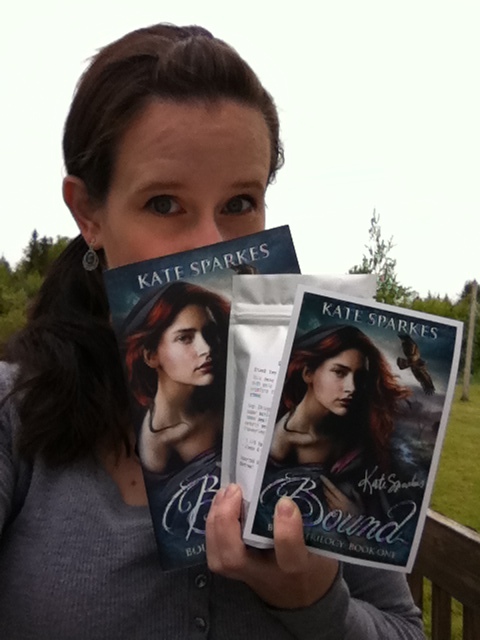 The Bound release party is happening June 26, 2014 from 12:30 to 8:30 PM EDT (Eastern). It’s a long party, and obviously I’m going to have to step out for bathroom and coffee breaks and to do silly little things like feeding my family, but this seemed like a good way to make sure that everyone who wants to can stop by, sign in, and participate in a few activities for a chance to win prizes. You’re under no obligation to stay for the whole thing. Prizes? Indeed. I’ll be giving out a few e-book copies of Bound over the course of the party (drawn for from participants in specific activities), and a grand prize of a signed paperback copy plus a bag of the magical tea I drink while I’m writing and an Amazon gift card. I might throw some more prizes in there if enough people show up. If you’re an author and would like to give away a copy of your e-book in an activity to get the word out, I’d be happy to help out. Just e-mail me (kate.sparkes @ live.ca). I’d like to make this about you guys, too. I couldn’t have done this without you. So here’s what you do: follow this link to the party page. Click up top (under the banner) to indicate you’re coming. Then on the 26th, look for the sign-in post so I know I’ve got your name for the grand prize, which will be chosen randomly from everyone who shows up. Invite friends, if you’d like. Look around, have some fun, join in discussions or activities if you’d like. Ask a question, if you have one. This is my first Facebook party, but I think it’ll be small enough that I’ll be able to keep up with everything. Mingle. Make some mew friends. Or be the weird dude who sits in the corner and talks to the dragonlings. That’s cool, too. It feels like we just did this. Um… everything approved with formatting. Should have that proof paperback in my hands Tuesday (or Wednesday, what with the mail being slow here). I’m about half way through my read-through of book two, and I’m getting some fantastic ideas about how to improve it. I’ve also had a most delightful realization about Aren’s grandmother. Nothing I could ever write into a YA series, but no one ever said that everything set in a world had to be for the same age group… you never know. I keep finding these characters who want to have their stories told, so even when this trilogy is over, I don’t think I’ll be done my work there. Frustrating, infuriating, difficult and just plain hard as this work is at times, I really wouldn’t trade it for anything. Release date still set for June 26, though I’m hoping to have e-book links available sooner, just to cover for retailers who are slower about putting things up. I may be queen of the procrastinators, but I think I’m actually going to be ahead of schedule for this one. I just jinxed it, didn’t I?